Last July, I mentioned that every photographers serious about their composition would understand the importance of "The Rule Of Thirds"; this week we will explore a composition technique through which you are able to create more interest and mood to your masterpiece! I am talking about adding a frame around your subject, a frame which draws the viewer’s attention to the subject. By Using natural elements around you to create a picture frame of the subject is a great way of adding interest and making a photo stand out from the rest! 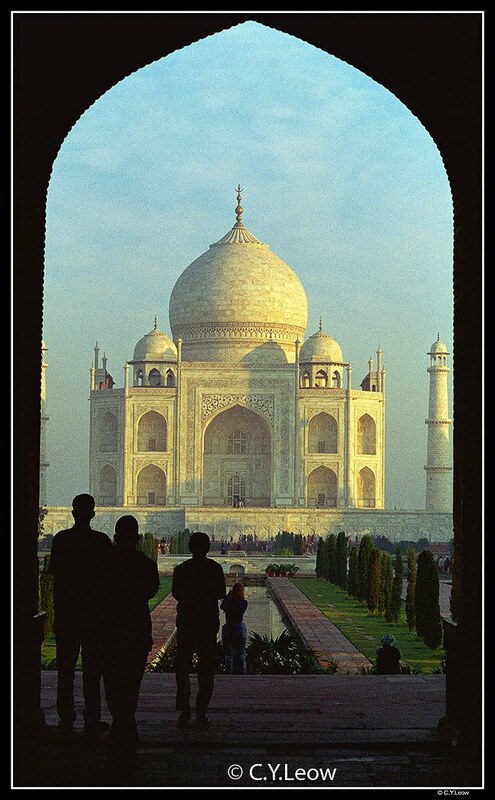 In this photo I uses the silhouette of the archway to create a natural frame around the Taj Mahal. Silhouette of the foreground people work together with the frame and strengthened the composition. 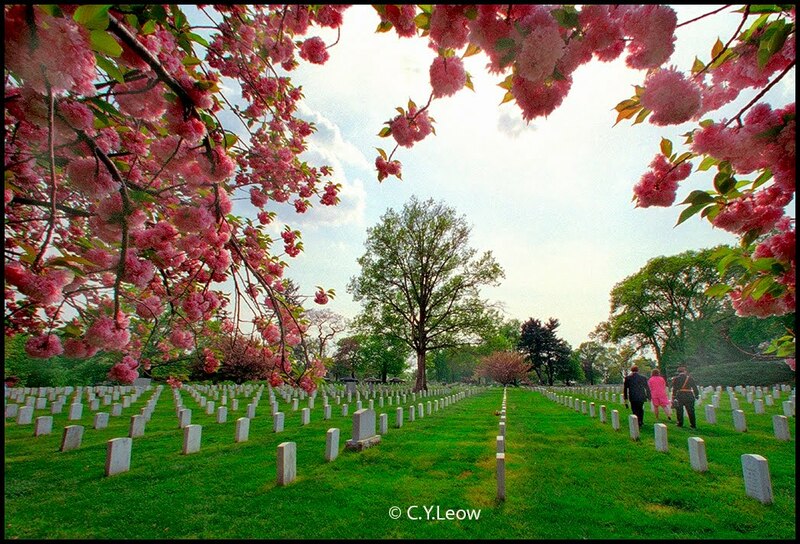 In this picture taken at the Arlington National Cemetery, Washington DC; I framed the bland, wash-out sky with branches of pink apple blossoms. Contrast, patterns and shapes add interest to the photograph. Intelligent composition and use of a 14mm ultra-wide lens emphasised the patterns and symmetrical of the tomb stones. As I compose, the three person walking past gave the composition a bonus! 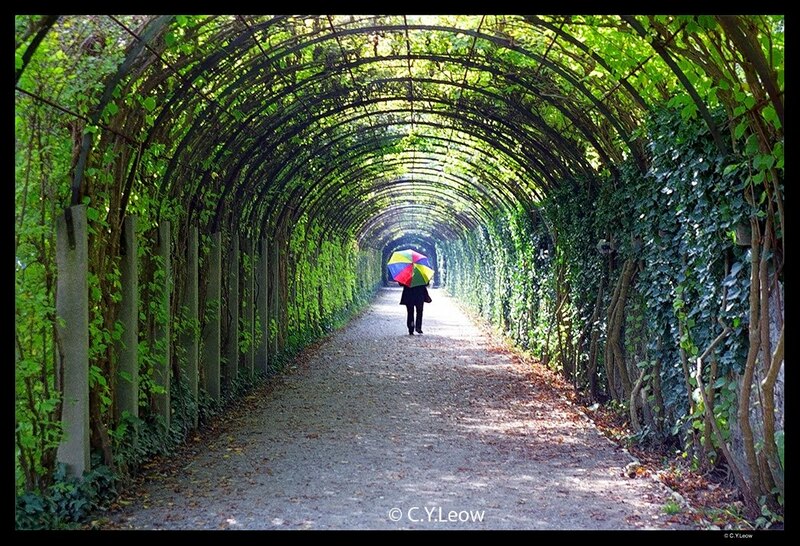 The impeccably maintained Pergola at the Mirabell Palace, Salzburg formed a natural frame drawing our eyes forward. Some scenes in the film "The Sound of Music" were filmed here. When framing a subject, ask yourself if your photograph will look better with the frame or the subject in focus, or maybe both? The above image shows the arches and foreground are all in focus, this is effective because the frame (the arches) are interesting. Notice how your eyes are naturally guided to the frame itself. 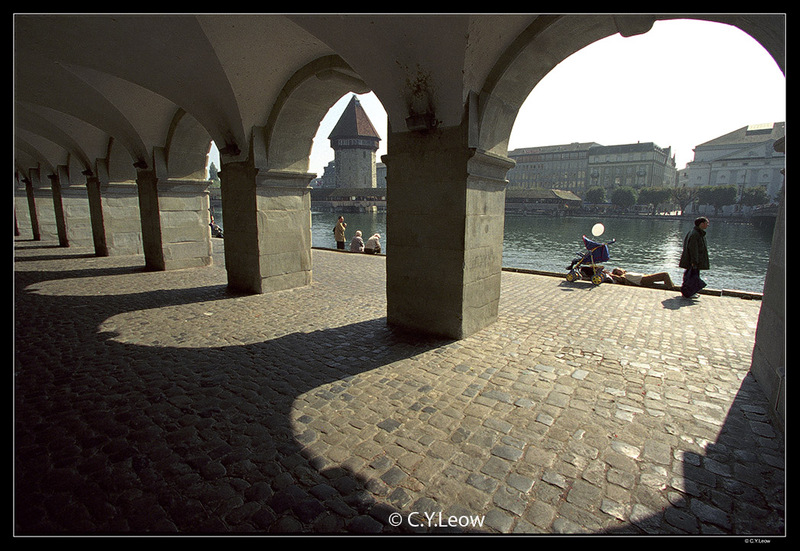 This picture was taken beside the Lucerne River with a 14mm ultra-wide lens. When shooting tall building in a big city like New York, you can quite easily use adjacent building as a "supporting" frame to make your main building stands out. 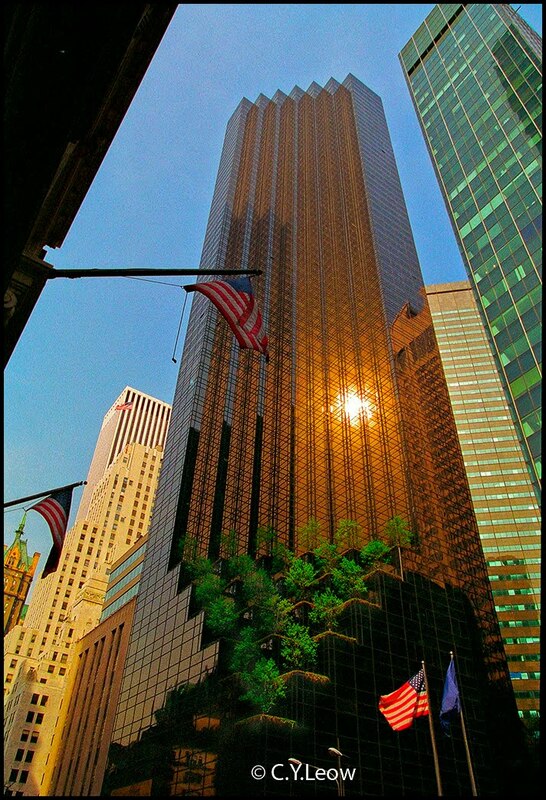 The Trump Tower framed by two lesser buildings, was bathed in golden New York setting sun. Shot with a 14mm ultra-wide on film. I love the variety of architecture in The Big Apple! With an ultra-wide you must watch out for too much empty space in your shot. 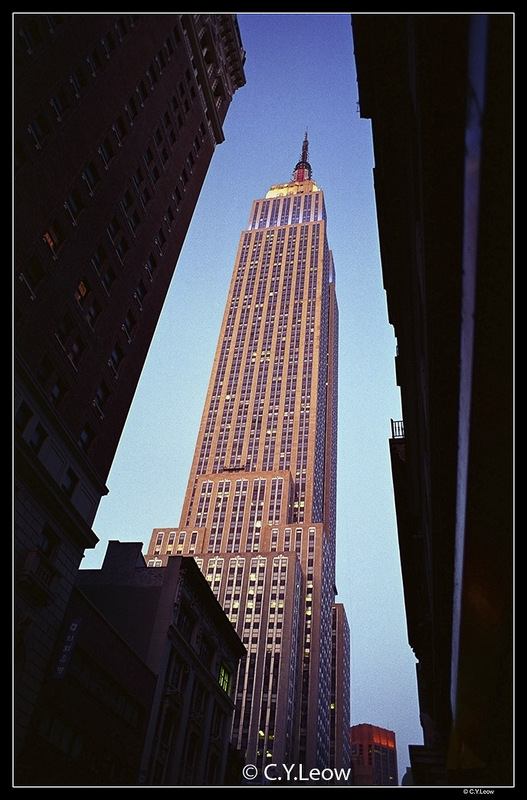 Framing your subject (the Empire State Building) is effective in controlling too much empty space around the main subject. Sometime a frame can be effective even if it was one sided. An effective frame does not necessarily have to surround the whole of your subject. It can be quite striking when the frame only surrounds a part of your subject. 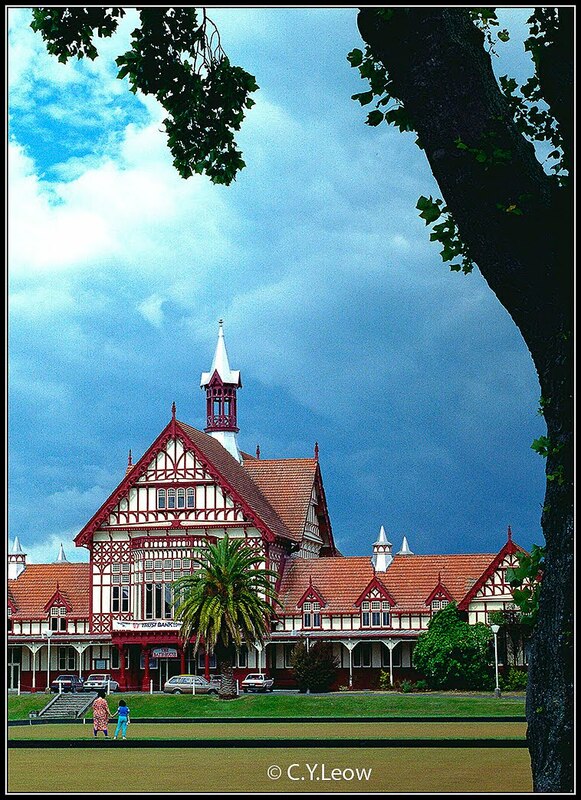 The colourful Bath House Building at Roturua, New Zealand was shot with the 90mm Summicron on a Leica M4-P, Kodak film. When in Bangkok, do what the Romans do? 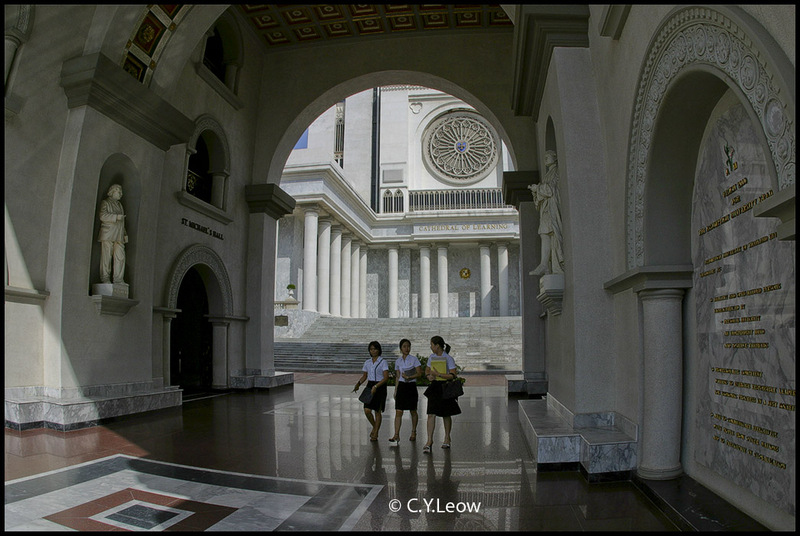 Two corridors from the majestic Assumption University in Bangkok were captured with my first DSLR, the Canon D60. The horizontal picture, using the massive marble arch as a frame was shot with a 15mm fish-eye lens. In the vertical shot, the Canon 28-80 zoom was used @ 35mm. 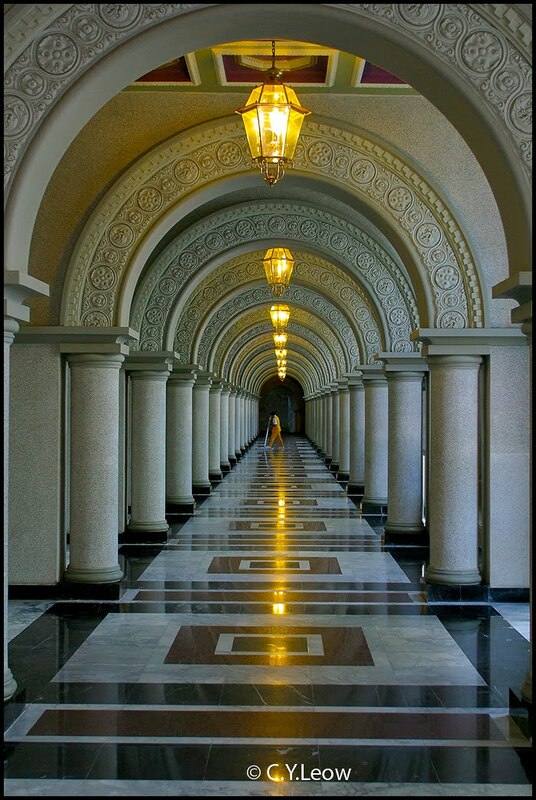 The pillars and continuous arches gave an illusion of immerse depth! 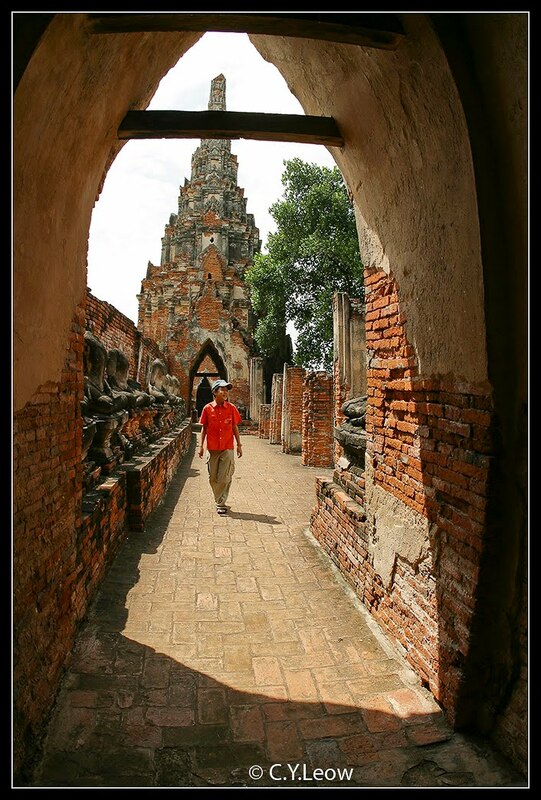 A ruin off Bangkok, the frame was a no brainer really ;) The shadow on the foreground helped too! D60 and 15mm fish-eye again. Can you see how the frame encapsulate the scene? Sometimes frame "just happen", for the better! This shot was taken in 1994 with an Nikon E2 DSLR, a Nikon+Fuji Film ventures. 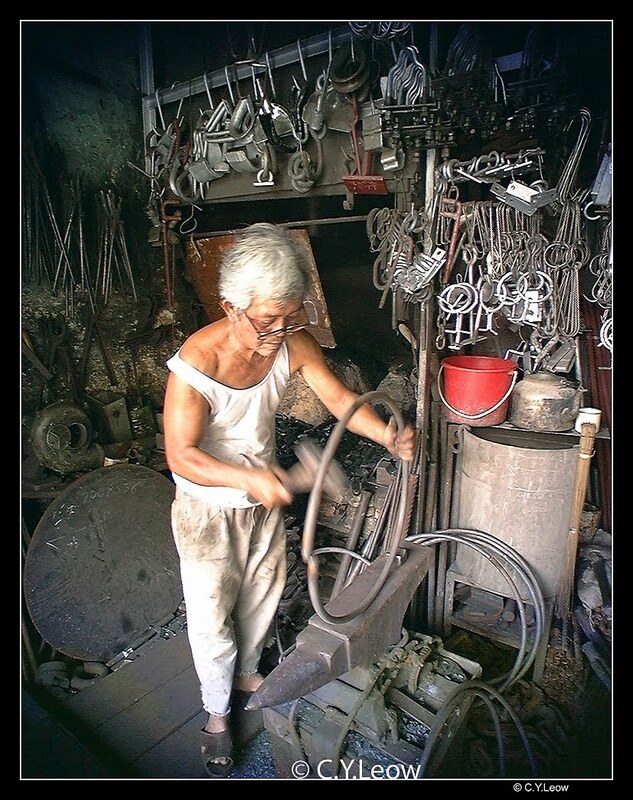 This shot with a Nikon 20mm lens of the "Iron Man" in Singapore, gave away the short coming of the E2 reduction lens system! I discovered if I use any lenses shorter than 24 mm with the E2, I get pretty bad vignetting of the four corners! The "defect" gave me a perfect frame! And strangely enough, the effect somehow gave the shot a special feel and look! I actually like it! And who know that ten years later, this effect is in fashion again! Now, of course; with Photoshop, you can dial in as much vignette as you wish! 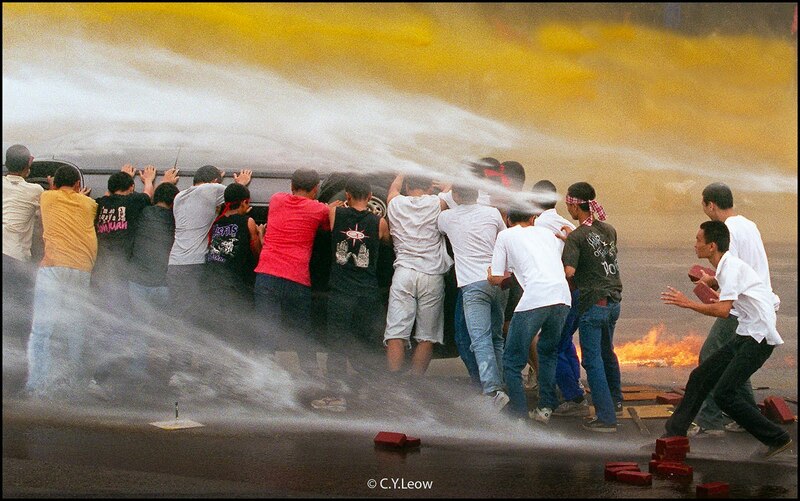 The dramatic picture of young rioters overturning a car while being blasted by a water canon, was only a show ;) for the President of Singapore. I love how the two water jet streams created a natural frame, framing in those naughty boys! It is not often you can find a frame that actually enhanced the action and movement of your shot! Picture was shot with a Canon EOS-1 with 600mm super-tele on monopod. Kodak film. Framing needs to be used discreetly, not every foreground element can frame your subject. And not every subject is complemented by a frame. However, if implemented correctly framing brings out some very interesting composition and strength of your image. Go and try it out! !